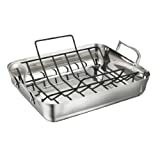 The Calphalon stainless steel roaster with non-stick rack is the best turkey roasting pan on the market. I love mine. When I was given the task of cooking the Thanksgiving turkey for our extended family of eighteen, I knew I would have to buy a large roaster pan to do the job well. Money was tight, but I wanted to invest in something that would last. In other words, I wanted to make a one-time roaster purchase, not have to buy another replacement roaster in three or four years. 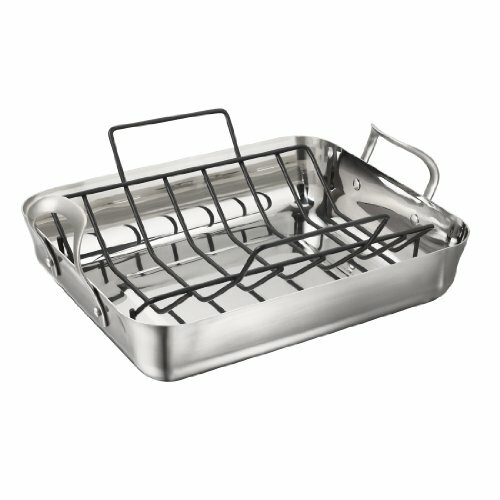 After researching several different kinds and brands of roasting pans, I settled on the Calphalon contemporary stainless steel roaster with a non-stick rack. These are the reasons I claim that the Calphalon stainless steel roaster is the best. Calphalon is well known for its excellent warranty which states, "Calphalon will replace any item found defective in material or workmanship when put to normal household use and cared for according to the instructions." Note that there is no time limit on that warranty! Stainless steel is classic. That is, it is beautiful no matter the time period. This contemporary finish is a slightly muted finish instead of a high gloss of traditional stainless steel. It is gorgeous. It cleans up very nicely without a lot of effort. Of course, this is not a non-stick pan, but considering that you bake it in the oven for hour upon hour, the clean up is remarkably easy. A gentle scouring sponge and some elbow grease do the trick even after the pan has sat for hours, neglected in the rush of a busy holiday meal. Remember to never use abraisive scouring pads on your stainless steel pans. And never put them into the dishwasher. The angle of the handles on this pan is perfect. Because they curve inward, the pan is easier to lift and doesn't hit the sides or door of the oven. Of course, the handles get hot when the roaster is put into the oven, but they cool down very quickly for easy handling. The feel of this stainless steel pan is substantial. It is heavy without being too heavy to lift when holding a 20 pound turkey. 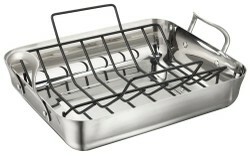 The non-stick rack comes with the Calphalon pan. It is especially designed to go with the pan and not scratch it. Like the pan, its handles make it easy to hold. After I cooked my turkey, it was a breeze to lift the rack onto a cookie sheet so I could collect the drippings for gravy. Then I easily lifted the turkey back into the pan for transporting it to Grandma's house. The rack truly is non-stick. Not any of the precious turkey skin was torn off as a result of sticking to the rack. Furthermore, it cleaned up with just a few swipes of a sponge. I am an avid thrift store shopper, but I can assure you that I've never seen a piece of Calphalon in a second hand shop. Do you know why? Because Calphalon will last your lifetime and never wear out. You will keep it forever and never need to buy another roaster pan again. Yes, you can buy multiple cheaper roasters for what it costs to buy one Calphalon stainless steel roaster, but those cheaper pans are cheaper for a reason. They are going to last you a few years and then the non-stick coating will peel off (into your food) and the handles will crack and break. A Calphalon pan is a lifetime investment. You will not ever need a new roasting pan. For that matter, your roaster can be used whenever a large, deep pan is needed. I use mine for making batches of homemade caramel corn and snack mix. Do You Own any Calphalon Cookware? Yes, I have a few pieces of Calphalon. Yes, I have lots of Calphalon cookware. No, but I have other stainless steel cookware. No, I don't have any Calphalon. There's always room in the kitchen for one more piece of Calphalon! My second most loved piece of Calphalon cookware is my huge, 8 quart Dutch oven. It goes from stove top to oven with ease. I use it constantly.